Anyway, I've got some Verve-aliciousness to share with ya'll today. I hope you've been enjoying the Project Parade over on the Verve Blog. 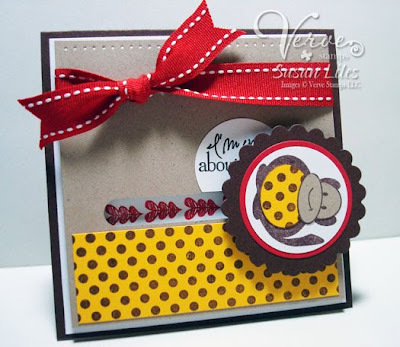 There's a great inspiration piece and as always, chances to win some new Verve stamps. My turn is next week, but I wanted to show ya'll a super fun card I made for this last release. I love how it turned out! It's the first spinner card I've ever done. I started it just on a whim as Jen and I were talking on the phone one day. Then I looked up the directions on how to fanagle the spinning contraption on SCS and found something close to what I needed HERE. It says to punch circles and then cut a "track" between the two, but I just used my old Word Window Punch from SU! (I knew there was a reason I was hanging on to it!). 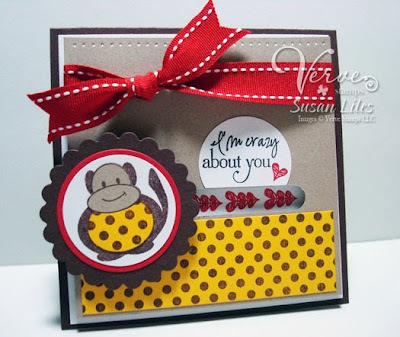 The little Monkey is from the Verve set, Love Monkey and I thought the sentiment fit nicely with the "movement" on the card. I also used the must-have background set, Bountiful Backgrounds from Verve for the polkadot paper and his belly. How do ya'll like my "action" shot? Dad-gum! I'm a real photographer! So I need to get moving here and pull out my pad and paper and get a list of things to do going for Eric. He needs to "feel the burn" equal to what I've been through this week. I'm really just kidding. I think I'll just sign this silly card and give it to him when I pick him up at the airport. I couldn't have done it without him. Thank goodness for cell phones and text messages. SUSIE Q-TIP: When you've had a rough week and your husband is feeling bad for you because you've had to take the brunt of the troubles on all by yourself, that is a good time to not only tell him you love him and appreciate his help even from afar, but also hit him up for ordering that Copic marker set you've had your eye on for a while, a new car, or anything else you've been putting off getting. He won't be able to argue with you on getting it. You've earned it. It's your reward. You know it and he knows it. And it won't be the last time you need a little "pick-me-up". You know it and he knows it. That's hope for the future right there. OMG this is super cute! 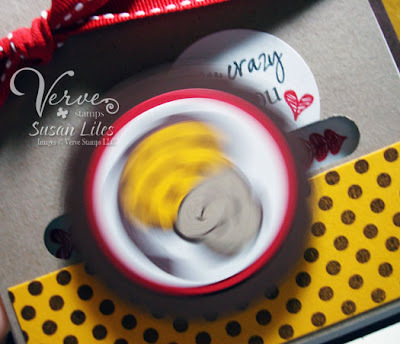 Love the spinning monkey! Goodness! I'm exhausted just reading about your week!! I so agree with your Susie Q-tip!! Such a sweet, adorable card! !